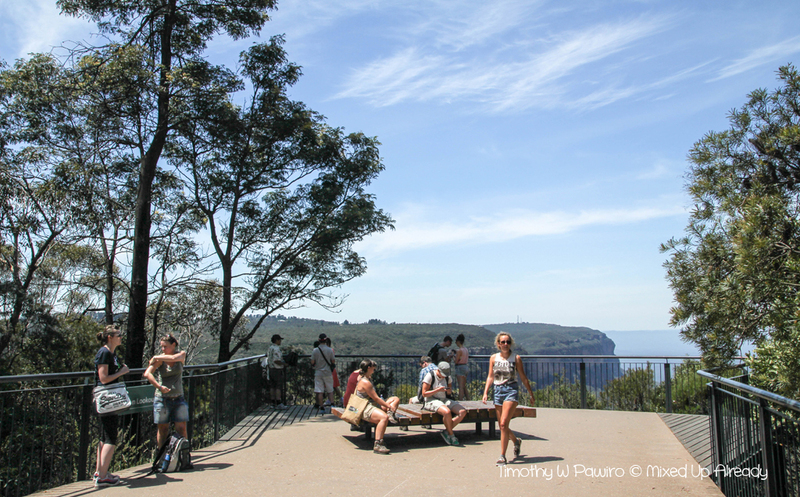 When myself and Yudhi were making the itinerary for the Sydney and Melbourne trip last January 2013, we agreed to take at least one guided tour outside of the city. 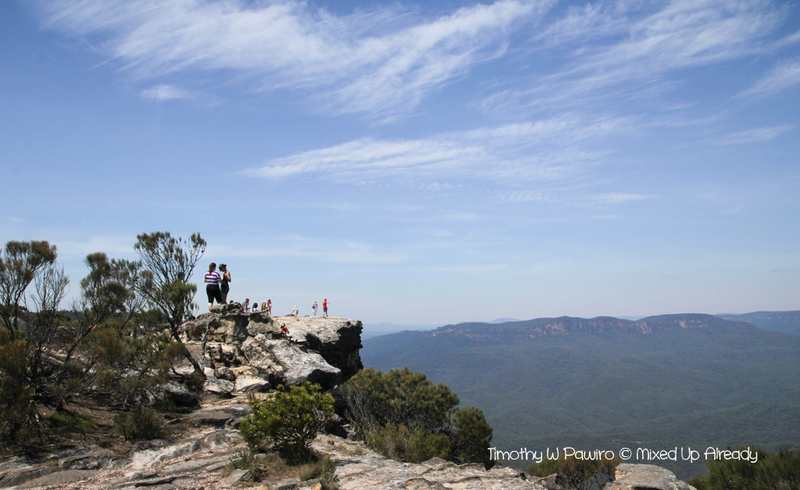 We had two choices between the Blue Mountains tour or the Hunter Valley tour. It’s a two different kind of tour. One needs a bit of trekking, while the other is enjoying the wine tasting. 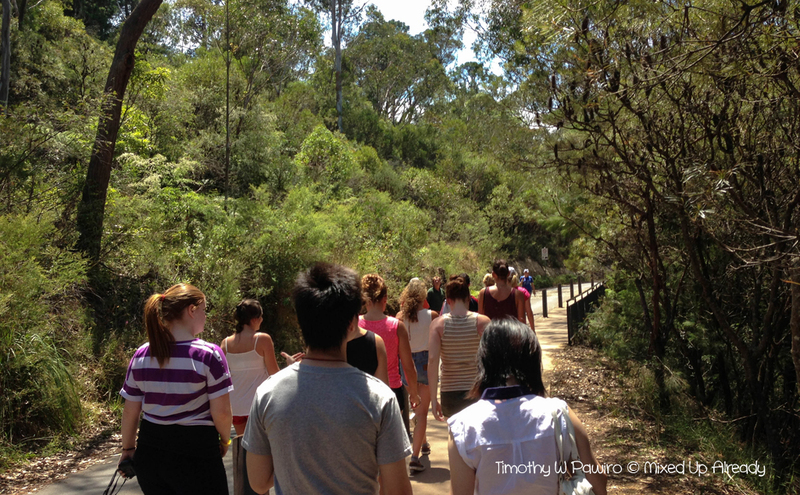 At the end we chose the first one, the Blue Mountains National Park tour. We actually could buy the tour online, but we decided to buy it in the Sydney Visitors Centre, who knows the price is cheaper or there are some options for tour. 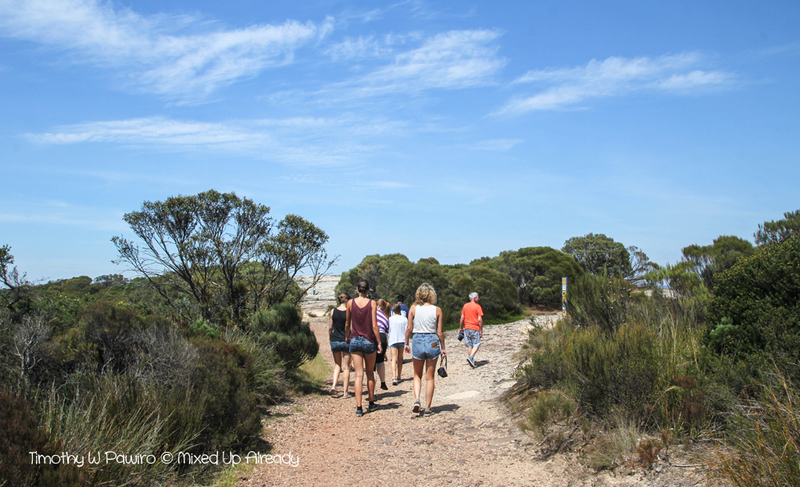 We did find two kinds of Blue Mountains tour, the first one with an additional of visiting a wild life place, while the other one, visiting a waterfall. We chose the second one, as we thought it’s more interesting. 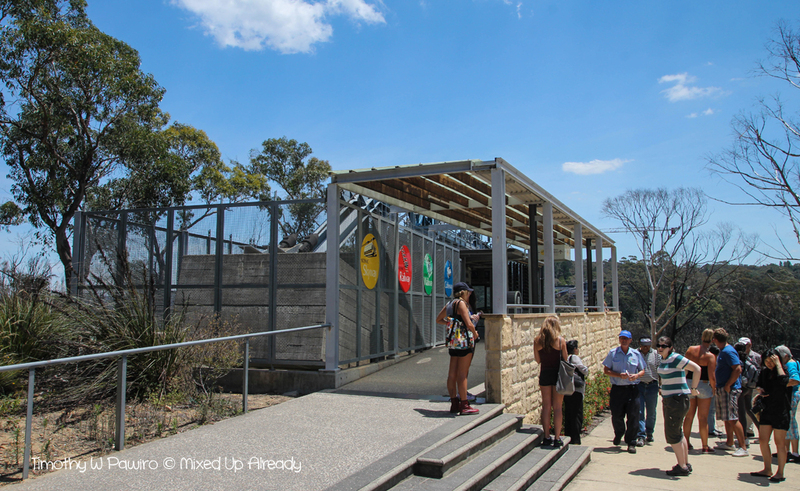 Not only we’re going to visit the waterfall, or perhaps to (just) see the waterfall from afar; the tour also include a short visit to the Sydney Olympic Park. On the tour day, we were picked up in front of our hostel. It’s a full-day tour, about 9-hour tour. The first visit was the Sydney Olympic Park. It’s located in the suburb area of Sydney. I thought we’re going to hop-off and explore this Olympic Park, but apparently it’s not. We just drove circling the complex, and the complex is really big with the ANZ stadium and a few of hotels inside the complex! 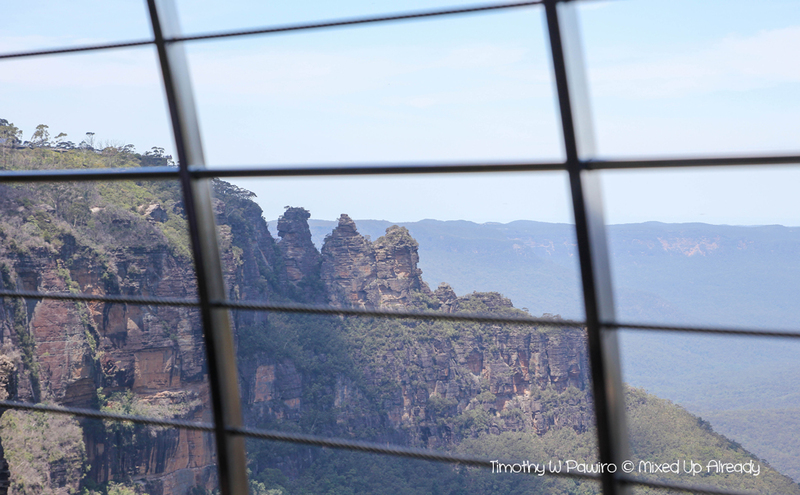 The complex is big enough that I believe we could not have much time in the Blue Mountains National Park if we did stop here and explore this Olympic Park haha! We then stopped at the Tench Reserve in Jamisontown, Penrith city to complete the registration and had some snack. 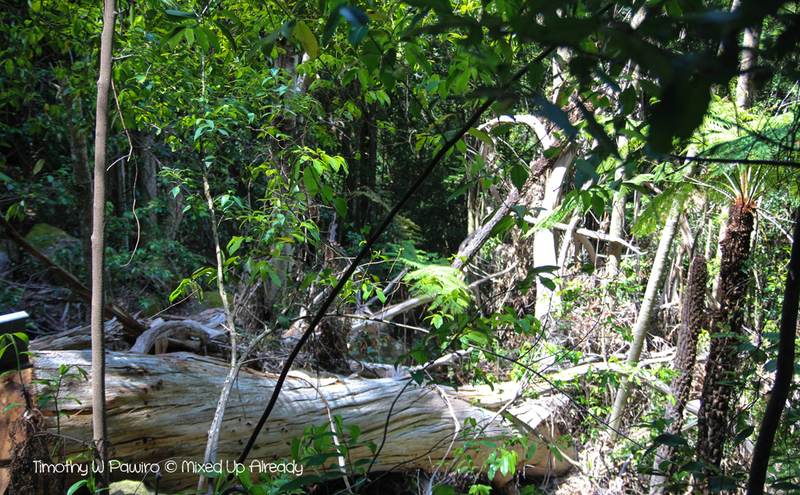 While I waited the others to complete the registration, I wandered off a little bit to see the reserve. I love this place! This place is quiet, and perfect for family picnic, and doing some river sport! After all of us finished the registration then we off to the Blue Mountains National Park. 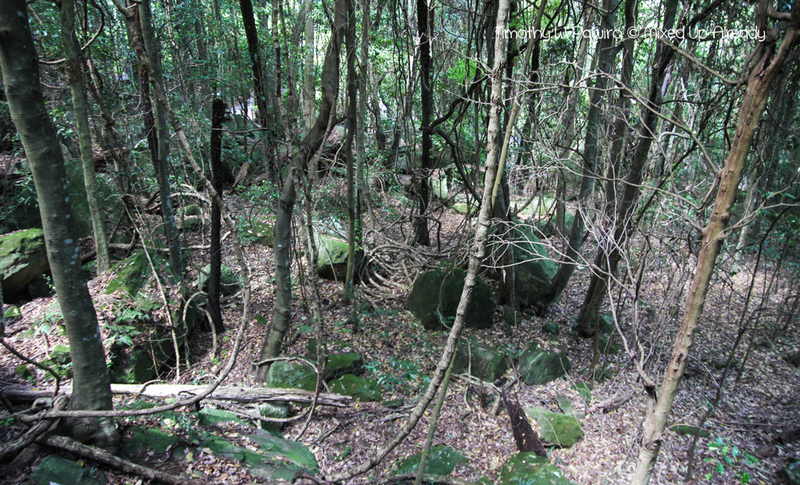 The Flat Rock is actually part of the sandstone hill in the Jamison valley of Blue Mountains National Park. We arrived at the top of the hill, and could see the vast valley of Jamison, overlooking the Mount Solitary. 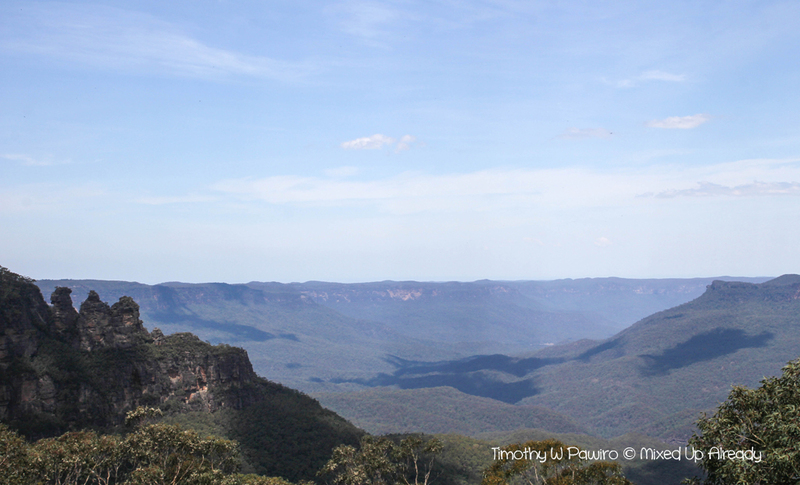 Ever wonder why the name of this place is ‘Blue Mountains’? 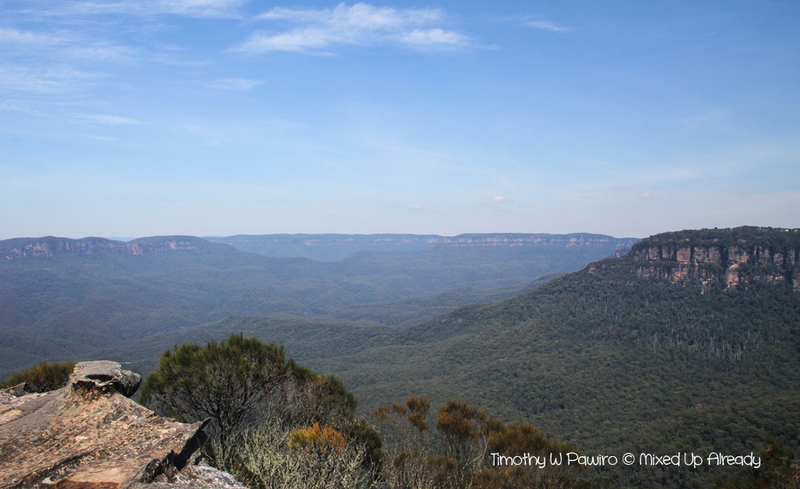 This part of Blue Mountains National Park tour was actually optional as we needed to pay more to join this part. There’s only one cable car, so we need to queue first before we could board the cable car. 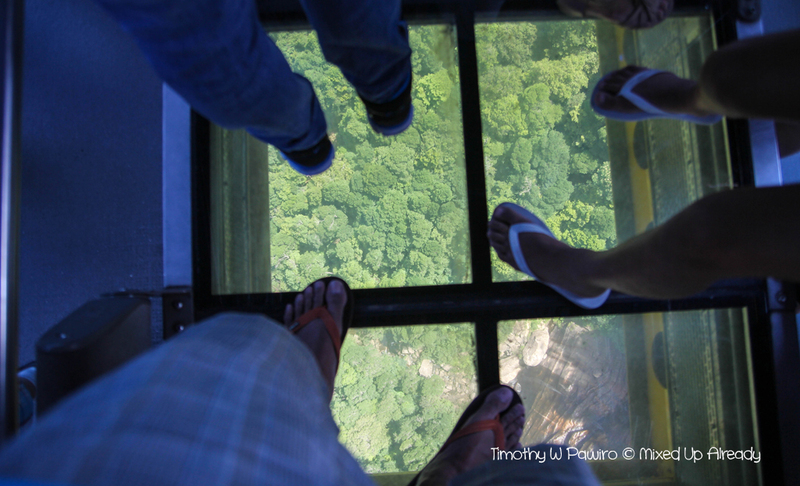 In the middle of the cable car, they have changed the floor into glass so we could see what’s beneath us. At first the glass looks dirty, but then they ‘switch’ the glass into a more clear glass. 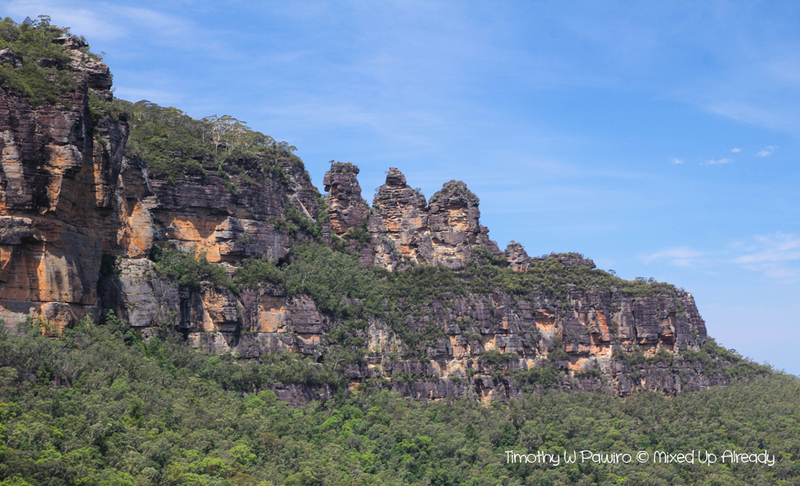 The Three Sisters is a rock formation where there’s a story behind that, from the Aboriginal legend. 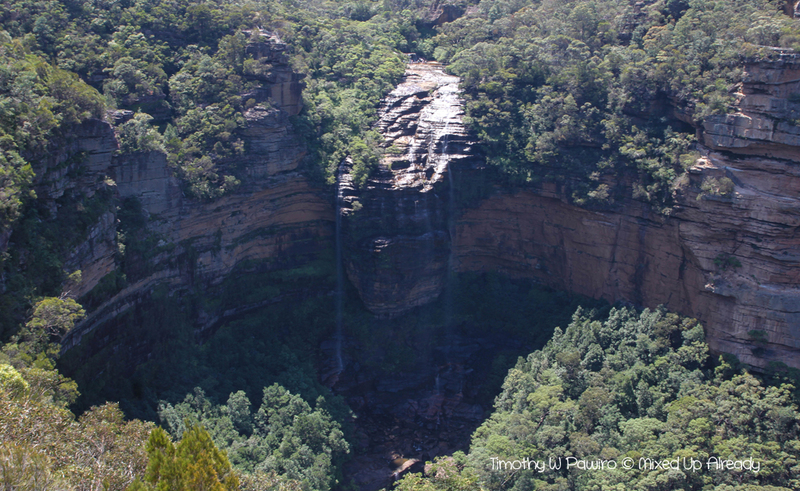 Once there were three sisters named Meehni, Wimlah, and Gunnedoo who are members of Katoomba tribe, lived in Jamison valley. These three sisters fell in love with three brothers, but the brothers were from different tribe, the Nepean tribe, and the trial law did not allow them to marry each other. The brothers then tried to capture the sisters which resulting of a battle. To protect the sisters, a witch doctor turned the sisters into stone and would turn the sisters back into human form after the battle ended. Tragically the witch doctor was killed during the battle, and sadly he’s the only person who could turn the sisters into human form. At the walkway, we passed a lot of trees, from the Sassafras, Coachwood, and many more. The trees are not just an regular trees, but they were really big and tall trees. Sometimes we could also see the lyre bird in between the trees. 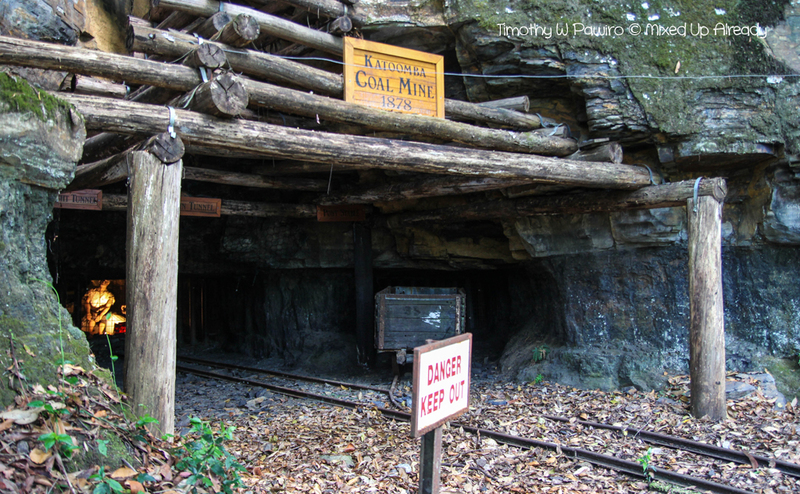 Another interesting thing to see of what is left from Katoomba Coal Mine that was opened in 1878. The railway that was under repaired, was actually used during the coal mine period to bring the coal from the mine to up the hill. This railway was part of tramlines network of the coal mine. They started using it for tourism activities from 1933, with the name of ‘The Mountain Devil’ after the end of coal mining activities. IMAX and the giant rubber duck in Darling Harbor! Interesting scenic trip especially the 3 sisters tale. Thanks for the heads up regarding the blue mountains. Yeah, hopefully when u go there later, they have finished repairing the scenic railway. I think it will be so much fun haha! Honestly I’ve never been to Australia before. Another reason to visit the city I guess.